After another year of dwindling polio cases, Rotary leaders, top health experts, and celebrities said on 24 October — World Polio Day — that the paralyzing disease has never been closer to being eradicated globally. 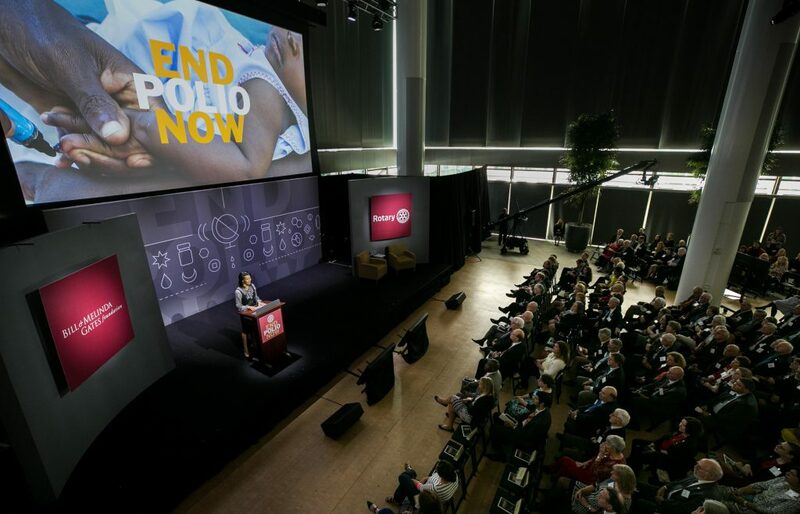 A special livestreamed presentation — End Polio Now: Countdown to History — featured the people who work tirelessly to end the disease and reviewed the progress that the Global Polio Eradication Initiative (GPEI) has made. Co-hosted by Rotary and the Bill & Melinda Gates Foundation, the 45-minute program took place before a live audience at the Gates Foundation headquarters in Seattle, Washington, USA, and was streamed online to viewers worldwide. Mark Wright, news host for the local NBC television station and president of the Rotary Club of Seattle, and CNN news host Fredricka Whitfield led the event. Wright updated the audience on the latest figures of polio cases saying that the total number of cases caused by the wild poliovirus so far this year is 12, with seven cases in Afghanistan and five in Pakistan. This is a 70 percent reduction from 2016 and is the lowest count of polio cases in history. Sue Desmond-Hellmann, the Gates Foundation’s chief executive officer, began the event by praising Rotary members and front-line health workers for their dedication to ending the disease.